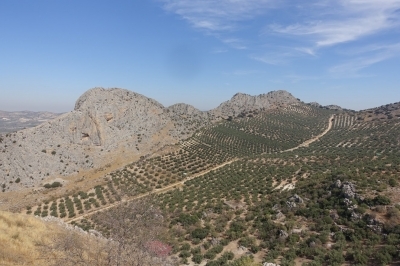 The Olive Grove Landscapes of Andalusia is part of the Tentative list of Spain in order to qualify for inclusion in the World Heritage List. Our excursion to the Rupestrian Art of Bessarabia was not the first post meetup trip Philipp and I undertook. One year prior after our meetup in Gibraltar I joined him and his brother on a trip to Antequerra. And having done my map homework I convinced both to do a quick stop in Archidona. They were heading to Ubeda and it was on the route anyhow. Archidona is one of the 15 locations proposed in the nomination. As is often the case with sites prior inscription we weren't quite sure where precisely the location was. We settled on the monastery on the top of the city mountain (Ermita virgen de gracia). And indeed just behind the monastery on the other side of the mountain we found an Olive Grove. The monastery was nice. The views, too. And I like olives. I am not sure this is enough. 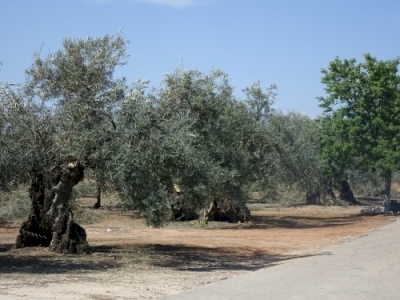 But maybe olive groves are the next vineyards, who knows? There are buses connecting Archidona with Antequerra and Malaga. Having ticked off Antequerra in the morning, I just continued onwards to Malaga. You should also be able to go via Loja to Granada. Archidona is a pleasant site with a nice Andalusian old town. I hiked down from the monastery through the olive groves and had lunch in town while I waited for the bus back to Malaga.